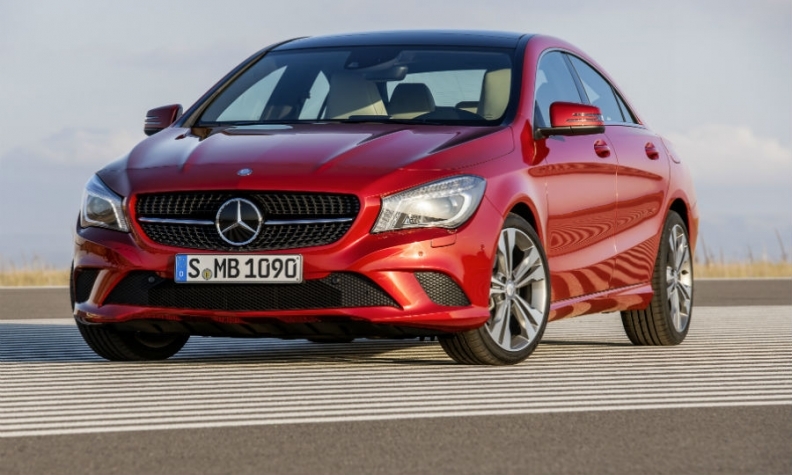 Daimler has boosted profits by expanding its compact range with models such as the CLA (shown). FRANKFURT -- Daimler's first-quarter operating profit more than doubled as its expanded compact car range and demand from China and the United States boosted vehicle sales to record levels. Group earnings before interest and tax (EBIT) from ongoing business rose to 2.07 billion euros ($2.9 billion) in the three months ended March, up from 949 million euros in the year-earlier period, Daimler said in a statement today. Revenue increased by 13 percent to 29.5 billion euros despite unfavorable exchange rate developments, the company said. Daimler CEO Dieter Zetsche said: "We made a good start to this year, as expected. As the year progresses, we will continue working systematically on our profitable growth path." Profitability at Mercedes' car division has improved as a range of new models including the A- and B-class, GLA and CLA compacts as well as its flagship S class hit showrooms, more than doubling the division's return on sales from ongoing operations to 7 percent in the quarter, up from 3.3 percent in the year-earlier quarter. Daimler said it aimed to increase that to 10 percent in the medium term. First-quarter deliveries rose 14 percent to a record 389,500 vehicles at the car division, which includes the Mercedes and Smart brands. Due to a more favorable model mix, the division's revenue increased 21 percent to 17 billion euros. EBIT was 1,183 million euros, up significantly from 460 million euros the year before. "The earnings development in the first quarter primarily reflects the ongoing growth in unit sales, especially in China and the United States," Daimler said. "These are exceptionally good numbers," said Hans-Peter Wodniok, a Germany-based analyst with Fairesearch. "The volume growth, especially in cars, and higher average prices have helped tremendously." The 7 percent profit margin was narrower than some analysts forecast and trailed the 10.1 percent at Audi. "Margins were a little weaker than expected due to higher top-line growth" and because of costs to roll out the revamped C-class sedan and the GLA compact SUV," Mike Dean, an analyst with Credit Suisse, said in a note to clients. He expected Mercedes to post a 7.5 percent margin, the same forecast as Bank of America Merrill Lynch. Mercedes increased deliveries in the first quarter at a faster pace than BMW and Audi, as the Daimler unit shows progress in its effort to regain the top spot in global luxury-car sales. The growth push involves rolling out 30 Mercedes models by the end of the decade, including a dozen all-new vehicles. "Daimler's rebirth and rehabilitation continues with these first-quarter results. This is supposed to be Mercedes's weakest quarter of 2014 with the changeover of the C class, so it bodes well for the rest of the year," said Bernstein analyst Max Warburton in a note to clients. Daimler reiterated it saw significantly higher EBIT from ongoing business this year. The Stuttgart-based automaker's first-quarter results stand in sharp contrast to last year, when Daimler warned it might have to cut its profit expectations only nine weeks after it had reported full-year results, blaming a slump in car sales. In February this year, Daimler said it expected group EBIT to increase "significantly" in 2014 from the 7.9 billion euros it reported for last year. Furthermore it said it saw significantly higher sales at the Mercedes car division than the 1.566 million cars it sold in 2013.